Larry started his professional career as a bass player at age 20. After performing with various Jazz, Rock and Soul groups from North Germany and a concert tour through Africa with seasoned German Jazz musicians, Larry joined guitarist Pierre Cavalli´s band in Switzerland. During that time he participated in several studio productions and performed at the Montreux Jazz Festival. 1984, back in Hamburg, he formed the Larry Mondello Quartet which became known in the New Jazz Scene for its innovative arrangement of Jazz standards. 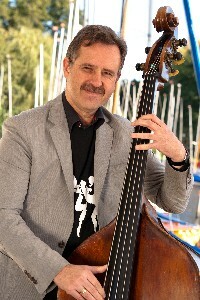 Larry joined Addi Münsters Old Merry Tale Jazzband in 1985. Since then, he participated in 6 CD and record productions and various TV shows. Countless concerts with the band in Germany and abroad offered him the opportunity to meet international Jazz legends. Larry also performed with Jan Harrington and her musicians in 1987. Today, Larry works part-time as a sound engineer and co-producer for various studios and musicians.